After a few consecutive weeks of monochromatic Commander decks, it's time to cleanse the palate a bit and get into something a little less restrictive. Magic: The Gathering—Commander (2014 Edition) decks have gone on sale, and the prices of the singles are dropping faster than people who bought all of the red decks at every Wal-Mart can list them for sale. Red isn't terrible anymore, white has more degenerate Equipment cards, and the green deck absolutely pulled my pants down by reprinting a ton of Elf cards I used to acquire in every collection I bought and that were worth a lot of money. Depending on whether you're in my situation, that last one might also seem like a good thing. Commander continues to attract new players, and the sealed product has given us a bunch of brand new cards to monkey around with. Life's pretty good for us hundred-card players. I didn't touch on the black or green decks much, and I only touched on the red and white ones by sheer, blind, stupid coincidence, but I still feel that we need to get into something multicolored before I forget how building that kind of deck works. I want to use a bunch of a new cards, but I don't want to just use new cards from Commander (2014 Edition). My solution? 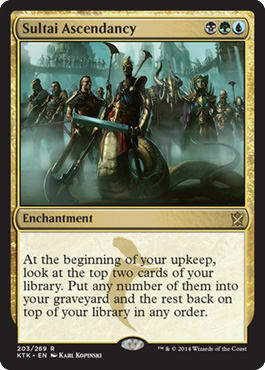 Find a deck that uses a lot of cards from one of the Khans of Tarkir wedges—preferably also the wedge mechanic—and also can use cards from Commander (2014 Edition). I think I have my answer in the form of a creature that is not only Sultai colors, but that gets a big kick out of the dredge mechanic and Sultai's ability to fill your ’yard up: The Mimeoplasm. My biggest challenge to myself this week is to build a self-mill The Mimeoplasm deck that makes use of Laboratory Maniac and doesn't bore me. My big reservation with a lot of Laboratory Maniac decks is that a lot of them tend to try to win the same way every game: Draw every card in the deck, and always win with Laboratory Maniac. If the end, configuration is always the same (eighty cards in hand, Lab Maniac and land in play, bored faces of friends), and I grow bored very quickly. I am hoping that with The Mimeoplasm encouraging me to do things with the cards I draw and mill, I'll play as though I have a toolbox deck, not as though I have a silly combo deck. Why include Maniac at all? Well, the reason is that I think he's a minor part of the deck here. If something goes super-wrong and I end up milling myself too much, if I get pantsed by Rest in Peace or Tormod's Crypt, or if it ends up my only path to victory due to some sort of stall I can't get around, it's good to have it as a backup. I want to prove to myself and others that Laboratory Maniac doesn't have to be such a boring card and can be a win condition and not the win condition. That's a lot of verbiage dedicated to one card, but I have been avoiding Lab Maniac for a while, and I think it's finally time that I tried him out in a situation in which I think he can be a part of a 75% deck. There are obviously going to be ninety-seven other cards in the deck, and while they can't all garner multiple paragraphs, I'm hoping their efficacy and cohesion will speak volumes. As a last aside, I will say that I'm not going to attempt to include any creatures with infect, and that's a personal choice. If you like the idea of Skithiryx, the Blight Dragon, Blightsteel Colossus, and Putrefax in your The Mimeoplasm build, have at it. I don't necessarily think they're the optimal choices for a 75% build, but I don't think I have too violent an objection to them. That path to victory isn't my style, and I think dealing someone a combination of damage and poison counters can lead to a situation in which you don't do either of those things well enough to win. I guess what I'm trying to say is that if you want to include some guys with infect, you can do so. Here are a few creatures that you can take out and substitute with infect creatures should you want to go that route: Golgari Brownscale, Golgari Thug, Phenax, God of Deception, and Stinkweed Imp. Without further preamble, let's get to the moment you've all been waiting for: the unveiling of the decklist. I tried to include a decent number of new cards I think contribute to the strategy of making sure you cast the best The Mimeoplasm possible by milling yourself. There are some new black cards in the Commander (2014 Edition) set that I think help you make sure your milling contributes to better card selection by helping you bring stuff back from the dead when you need to, although that's not our primary goal. I added a lot of Sultai cards because all of them are quite good. I wanted to make room for Sultai Ascendancy because it functions as a better Mirri's Guile in the deck, but there aren't too many other cards I would try to make room for. Sultai Charm does some serious work. It may seem like a bit of a nonbo to try to run delve cards in a deck like this, but with all of the lands and other spells you will be milling, you can be aggressive and run Treasure Cruise and Dig Through Time. Why not benefit from all of the stuff you'll pitch into the ’yard? Treasure Cruise also gives you some draw triggers if you want to dredge instead. Greater Good is another good enabler for dredge. If you want to put a lot in your ’yard at once, Greater Good is your guy. That card will do serious work in the deck, especially paired with cards like Wake the Dead. Crypt of Agadeem may seem cute, but there are some situations in which the mana will come in handy, not the least of which is my dream of casting a 15-point Villainous Wealth on someone and dropping an Eldrazi. While you're not trying to win by milling opponents out, Mesmeric Orb may be a good way to stifle Elf combo decks or decks that want to attack with a million tokens or repeatedly untap something. They'll think twice about that Prophet of Kruphix. Orb also obviously helps you. 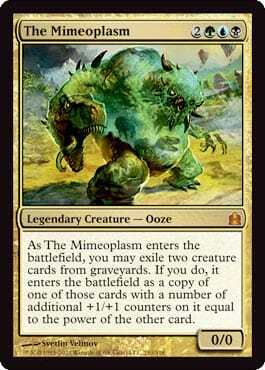 Your win conditions are pretty straightforward: Make The Mimeoplasm scary, and then kill the opponents. You can also mill yourself out entirely and win with Laboratory Maniac, you may end up reanimating your whole ’yard for a lethal alpha strike, or you may make a 67/67 Vulturous Zombie and fly the unfriendly skies. There is a lot of synergy here—and also a lot of raw power. What I didn't do was include tutors, preferring to use the graveyard as a place to store cards temporarily so we can access them later if need be. I would dredge and mill aggressively even though a lot of our spells would be sad to mill away. We always have our commander for backup, and a full ’yard is a happy ’yard. We could build this with retrace in mind. 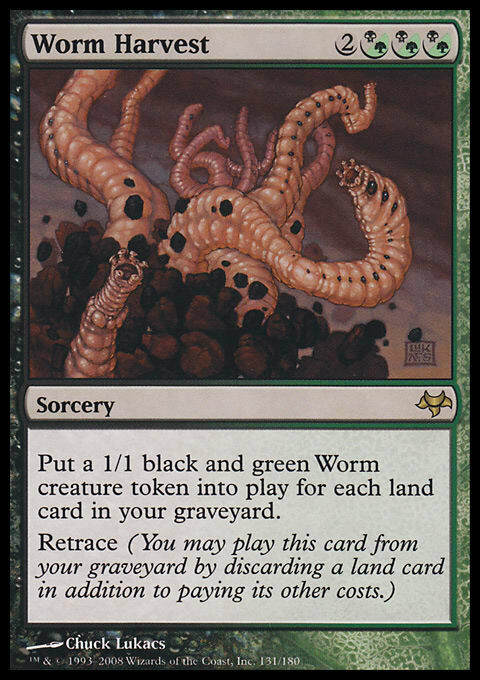 If you want to find room for a Worm Harvest, that could be a pretty good inclusion in the deck. You won't have much use for the Worms other than smashing people with a ton of tokens, but that's not a bad plan. You’re The Mimeoplasm has a lot of good options. My personal favorite idea is making him a 12/12 with Hydra Omnivore's abilities, but there are a ton of fun combinations in there. Remember the noted creatures you could lose if you wanted to run the deck with infect. So, how did we do? Did I try so hard not to bore myself that I strayed too far from what makes a The Mimeoplasm deck good? Did I forget something saucy that would go well with the configuration I have? Did I add too many new cards? Leave it in the comments section! That's all for me this week. Join me next week, when I take on another exciting challenge!